On Monday, January 21, 2019 from 0236 GMT until 0748 GMT there will be a total lunar eclipse. For those in the U.S., I'll translate. The lunar eclipse will run from Sunday, January 20, 2019 at 9:30pm EST until Monday, January 21, 2019 at 2:45am EST. In North and South America, the entire eclipse will be visible from the penumbral, to partial, to full eclipse and back again. Other parts of the world will be able to see all or much of the lunar eclipse, though much of Asia and Oceania will miss it entirely. If you're in the northeastern U.S. like me, the initial partial eclipse phase will start Sunday, January 20, at about 10:33pm EST. The full eclipse will begin at about 11:41pm EST and end on Monday, January 21, at about 12:43am EST. The ending partial eclipse will end at about 1:50am EST. The maximum eclipse will occur on Monday, January 21, at about 12:12am EST for us. Whether or not the weather will cooperate wherever you are is unknown. At this time it doesn't look good for me. Hopefully, it will work out for you. I'm going to prepare my gear in case the forecast is wrong. A lunar eclipse occurs when the Earth's shadow blocks the sun's light which would otherwise reflect off the moon to the Earth. There are three eclipse types: total, partial and penumbral. The most dramatic is the total lunar eclipse, during which the Earth's shadow totally covers the moon. There is typically almost one total lunar eclipse annually. This year's total lunar eclipse is a “super blood moon” eclipse. 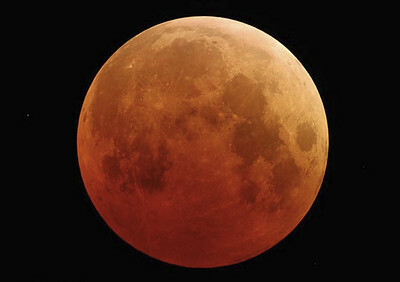 The full moon during the eclipse will appear to be one of the biggest and should appear copper-colored, as the moon will pass through the top portion of the Earth's shadow. Unlike the serious precautions we all must take for a solar eclipse, no precautions are necessary when observing a lunar eclipse because “moonlight” is never bright enough to hurt our eyes. How do you photograph a lunar eclipse? There are two popular types of lunar eclipse photos. Each one can be easily made with a DSLR or MILC camera and a tripod. The predominant eclipse photo type is the close-up. Photographers use a telephoto or super-telephoto lens to capture the moon's detail as the eclipse moves through its phases. The other type of eclipse photo is a wide-field composite image. It shows the phases of the eclipse, as the moon moves through the sky, in a single image. What lens should you use for close-up eclipse photos? For close-up eclipse images, a moderate focal length, 300mm telephoto lens can capture reasonable detail of the moon, however, a longer lens, such as a 500mm is preferable. Consider using a teleconverter with your lens. What lens should you use for a wide-field composite eclipse photo and how do you set it up? The moon moves across the sky at about 15 degrees per hour. To capture the eclipse fully from the initial partial eclipse until the end of the final partial eclipse, the moon will go through about 50 degrees. Therefore, I suggest the use of at least a 28mm lens on a full frame camera. To shoot the composite in the northern hemisphere, the moon moves from left to right through the sky. Therefore, at the start of the eclipse, position the moon in the left side of the frame leaving it room to move across the image. (Reverse that in the southern hemisphere.) After the eclipse, back in your digital darkroom, stack your images to produce the composite. Having a building or some structure in the foreground can add great interest to your composite image. What exposure settings should you use to start? Many photographers might think they should compensate for the low light intensity of an eclipse by setting their camera to a high ISO. That could result in significant digital noise and it's not needed. I suggest setting you sensor sensitivity as low as possible. An ISO of 200 should be useful for many photographers. In North America, it's winter. The cold temperatures will help you keep noise low. Lenses are rarely sharpest at their widest apertures. I suggest setting your aperture to f/7 to f/11 to capture the details of the moon's surface with good sharpness. As the eclipse progresses, the light will diminish, go almost dark, then increase until the eclipse is over. Use your meter to set the shutter speed of your camera as the light output from the moon changes, but I suggest keeping your shutter speed at 1/125 second or greater to fully take into account the movement of the moon in the sky, to keep the images sharp. You can maintain shutter speed by adjusting your ISO as needed. How do you focus for sharp eclipse photos? When the moon is bright, your camera's autofocus should have no problem locking on to the moon, however, as the moon goes dark, autofocus may lose its ability to lock in the focus. After your focus is set, if you're not using back-button focus, in which the shutter release button has been decoupled from autofocus, set your camera to manual focus and don't move your lens' focus ring. Is there anything else you need to know to make great eclipse photos? • Always use a tripod for your eclipse images to ensure maximum sharpness. • Use a remote shutter release to eliminate camera shake from pressing the shutter release. • Use a fully charged battery at the start of the eclipse. Have a spare, just in case. • Consider bracketing your exposures to ensure you have the optimum quality images. Photographing an eclipse is something like photographing a wedding. You only get one chance. So be prepared to shoot the eclipse in advance. Get your gear ready to go and arrive where you'll photograph the eclipse, well in advance. Set everything up and enjoy the shoot. Make sure you view the eclipse with your own eyes too, not just through the viewfinder. I didn't know an eclipse was coming. Thanks for the heads up and the great advice. This isn't getting any play in the newspapers and TV so far. I had no idea it was coming. Thanks. Oh, and great advice on getting photos of the Eclipse. I actually did know it was coming, but I had never thought about a wide-composite. Thanks. I'm going to try it. Great article. Thanks for including the link to your Back-button focus article. Somehow I missed it. After reading it, I immediately changed my settings and tried it out yesterday. It's my focus method from now on. Keep the articles coming. The best tip in the article is back-button focus. It's the way to go for any photo. Very helpful to know how to calculate what lens to use for a wide angle composite shot. I'm charging my batteries right now. The forecast looks like a mess that will stop me, however. This is exciting. I hope I have no cloud cover. I'm set. I will definitely bracket my shots as I've never shot a eclipse before. Thanks for the article.